I've been lazy. At least computer lazy. I've got all these pictures from my last trip edited and ready to post about. But like I say, I've been lazy. You might remember that one of my lifetime quests is to get a good picture of the plate valance at my sister's house. I failed. Again. After I posted a picture of it after my last trip I got a question from Kim asking details about how the plates were hung. I couldn't remember. I talked my sister into creating this plate valance and told her how to hang it. That was years ago. And dang if I couldn't remember what I told her. Kim, this picture is for you! It is as I assumed I would have told her. Hang the plates for the back layer with a nail and a plate hanger. 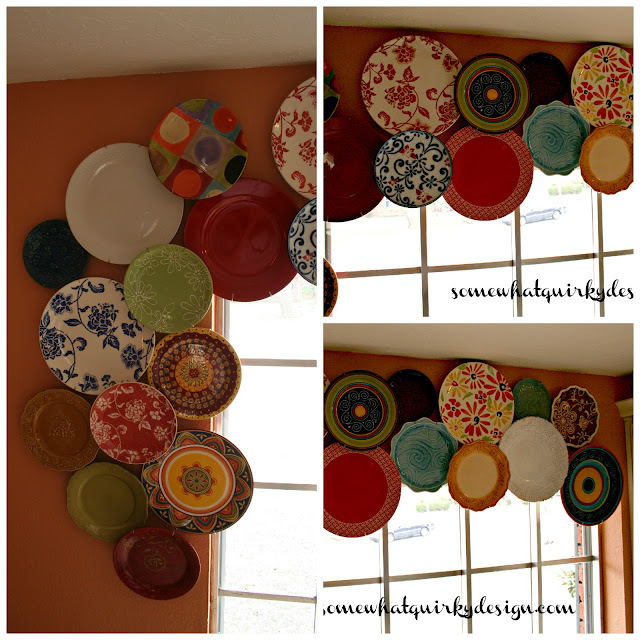 Take a piece of scrap wood and attach it to the wall in the spaces where you want your upper level plates to raise above the others. 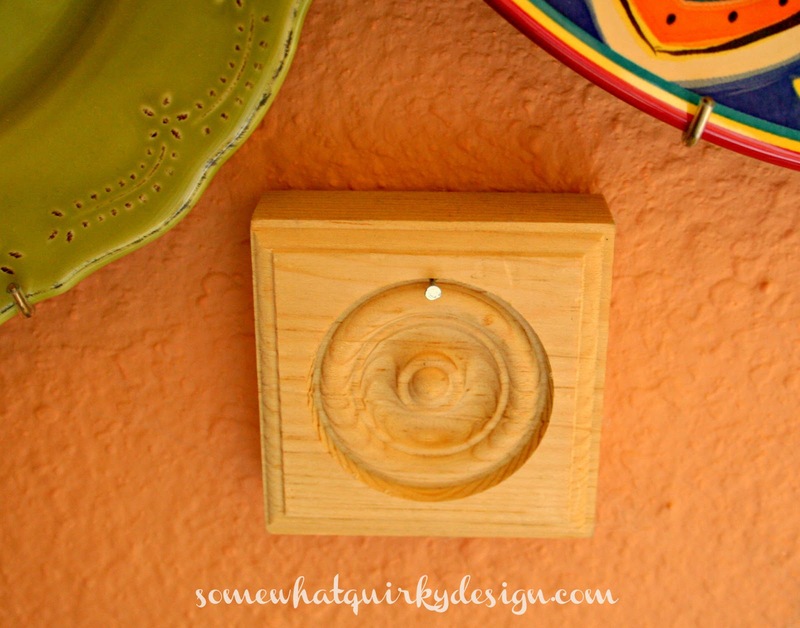 Then put a nail in the raised wood and hang your plate. It's as simple as that. These plates are hung with regular old plate holders. This method would also work with the Disc plate holders. But at 5 bucks a pop, it would cost $125 to hang this valance. That's a lot. I'm thinking that until I get some advanced picture taking skills under my belt I will quit taking pictures of this valance. This is awesome! I want a plate valance! LOL! It's beautiful! I love this idea! Where is your pin it button?? Wow! THat is one very cool valance! I didn't think your pictures were bad at all Karen! I actually got up and went and looked at my kitchen and dining room windows to ponder this idea. That is a very impressive display of plates and I love the effect. It's so different too. Love it Karen! I like thinking up something different and this is!! Wish I thought of it! It is hard to take pictures shooting into the window. It came out pretty good considering. 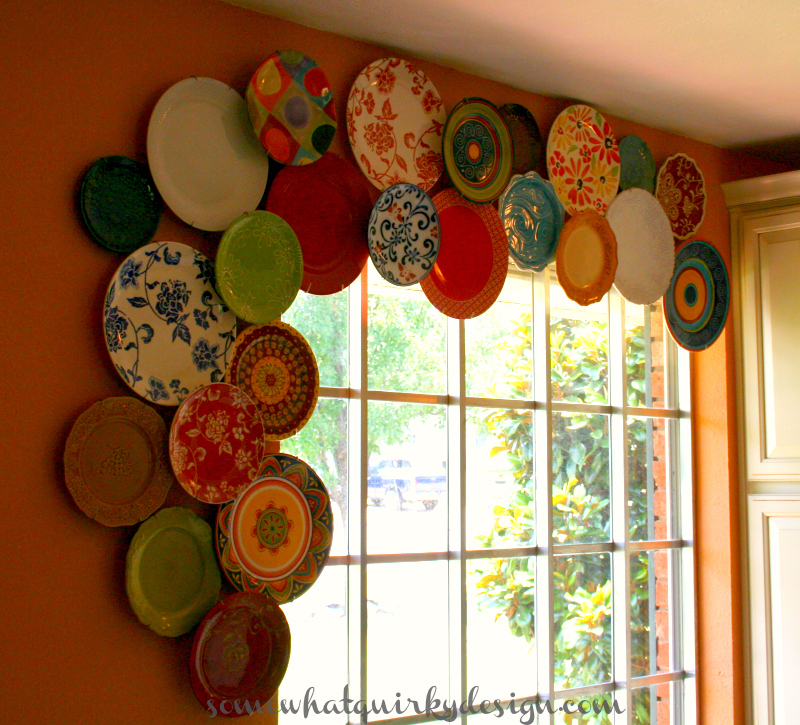 Great idea, and I love the whole randomness of hanging plates this way, instead of hanging them symmetrically. I remember falling in love with this the first time you posted it! This is totally adorable and unique! I love it! Totally fun idea!! I love all the different plates that you used. What a cute idea! I would love to do something like this in my dining room. I love this! It reminds me of buttons all together, which is something I have a passion for! Wish I had somewhere to try this! Found you on Hometalk! I am crazy for this! Terrific. i am in love with this!! Im off to the thrift shop to find some cute plates!! OHGOODHEAVENS!! Now I'm gonna have to make one, aren't I? Why ohwhy did I come across this post? LOVE IT!!! Oh I LOVE what you've done!! I too save things because "I might be able to do something with it someday" - and now I've been saving stuff for 35 years....hmm, not a hoarder though! I have at least 8 sets of dishes, and now I can finally do something cool with some of them - THANK YOU! Now where did I put all of those plate hangers I bought on sale in 1979? Looking forward to checking out your other posts and following your blog! I am remodeling right now and doing a cross between French cottage and farmhouse... sooooooooo doing this in my kitchen with some cobalt blue and white plates.. Thanks so much for the information and tutorial, I love different and odd and this is just gorgeous! This is SO AWESOME!!! I love the wall color, I love the plates...I am inspired! I just came upon this today but omg I love it! Thank you for the wonderful idea!! The way the wind blows around our house I'd be afraid they'd all end up on floor in pieces, if I had windows open.When the wind blows out here it's like a mini tornado. Sure looks pretty tho, love all the different colors and designs on plates. I get too tired of things to make that many holes in wall after I waited for 8 yrs to get walls painted, lol. That wall looks fantastic and one of a kind, which I'm really fond of. Great idea to combine them all at once.